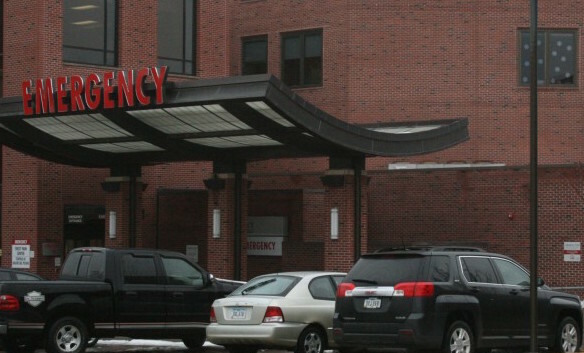 The emergency entrance of Mercy Medical Center in Cedar Rapids is shown in this file photo. An American College of Emergency Physicians survey revealing that nearly 50 percent of emergency physicians have been physically assaulted on the job comes as no surprise to Dr. Matthew Aucutt of Cedar Rapids. The American College of Emergency Physicians survey showed that 69 percent of the 3,539 respondents — including 28 from Iowa — said they believe violence in their workplace is increasing. The email survey, with California, Texas, New York and Florida providing a little more than a quarter of the responses, had a margin of error or plus or minus 1.6 percentage points. The violence often amounts to slapping, kicking, spitting on a health care work or biting. It is directed toward the doctors, nurses, technicians and other health care workers in the emergency room, not other patients. Close to four of every five emergency department doctors responding to the national survey said it affects other patient care because of a loss of productivity among staffers, the emotional trauma of being hit by someone staffers are trying to help, and longer wait times for others needing emergency care while department workers deal with the problem at hand. “When you have an incident like that, it can throw you off the whole rest of your shift,” Aucutt said. Factors leading to the violence include patients with mental health problems, or with alcohol and drug issues. Another factor, interviews revealed, is patients in pain who have become addicted to opioids, often included in medicine prescribed by a doctor at an earlier time for pain control. Scott McIntyre, vice president for communications at the Iowa Hospital Association, said workplace safety is a high priority for hospitals. “I would say that there’s a growing desire to address the problem,” he said. McIntyre said the association trains hospital workers for things such as de-escalating potentially violent situations and improving ways to provide security while still maintaining accessibility for the health care facility. “People expect hospitals to be very accessible. That’s in line with what they expect from health care — accessible health care,” he said. But, that presents challenges, he said. At Mercy Medical Center in Cedar Rapids, a central safety committee works on workplace issues. The hospital has a safety reporting system, increased security for the emergency department, a safe place for staffers to go when violent situations arise, and other safety protocols. Aucutt said burnout in a hospital emergency department can run high because of job stress. Eric Voss, Mercy’s director of emergency services, said a lot of the people the hospital recruits for his department are aware of the work environment because they have seen it while training, as a technician, for example, while attending nursing school before becoming an emergency room nurse. “They know what they’re getting into,” Voss said. That doesn’t mean, however, accepting violence from patients as the norm. “We’re putting in safeguards for our staff,” he said. This IowaWatch story was republished by the Des Moines Register under IowaWatch’s mission of sharing stories with media partners. Final Years, Troubling Choices: First of a Three Part Series.